My new Hohner Telecaster, made in Japan in the 1970’s most likely by Morris in the Moridaira factory. This weekend I received a 1970’s Japan made Hohner Telecaster. These old Hohner’s have a nice solid feel to them and good resonance even though the bodies are made out of plywood, or some form of wood sandwiched together. Having said that, this Telecaster is extremely heavy so maybe they sandwiched a chunk of mahogany together with an ash or alder top layer. This would have put me off if I wasn’t so gay for my old beat up Hohner Strat. This was one of the first Japan made guitars I bought, I found it in a charity shop in Camden in London for £50 in 2009. It’s not the best Strat I have ever played but the neck is really chunky and the pickups sounds really good. It’s the same with the new Hohner Telecaster, pretty nice neck and great pickups. 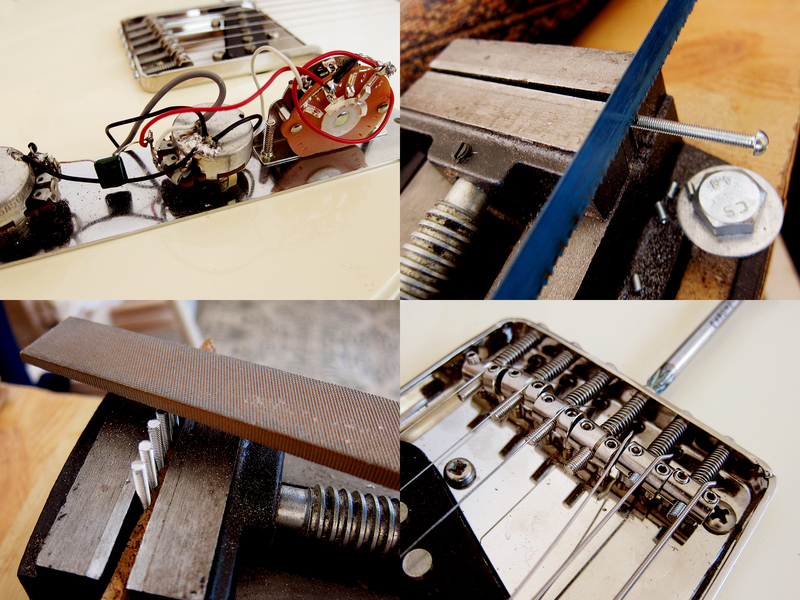 The neck pickup actually sounds a bit like the in-between neck and middle position on a Strat. I would have preferred that the Telecaster neck was a wee bit thicker, but it’s still very playable. Hohner only produced guitars in Japan for a couple of years during the late 1970’s and later moved to Korea like a lot of other brands. 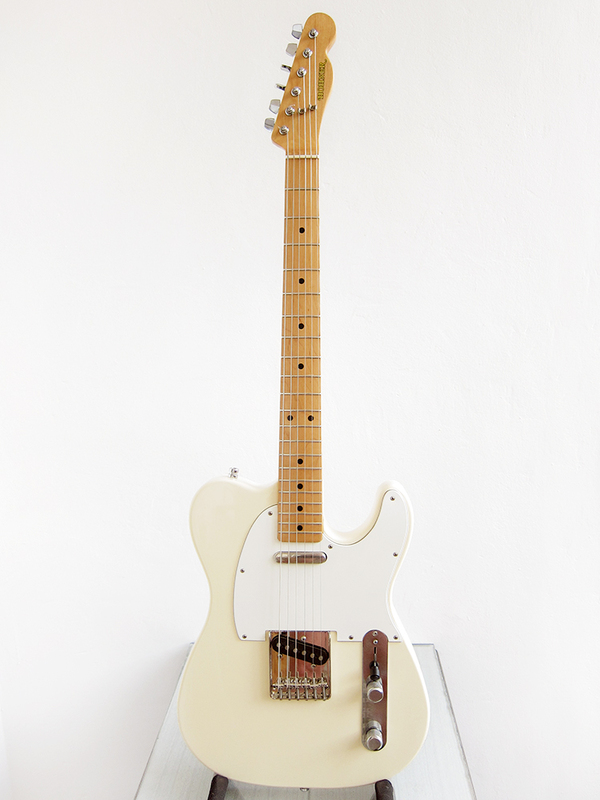 I really enjoy this Telecaster but I have too many guitars at the moment and therefore it’s up for sale. According to my previous post about Japanese guitar brands they were made by Morris in the Moridaira factory. I took my list from Who Made My MIJ Guitar so I hope we can trust his research. 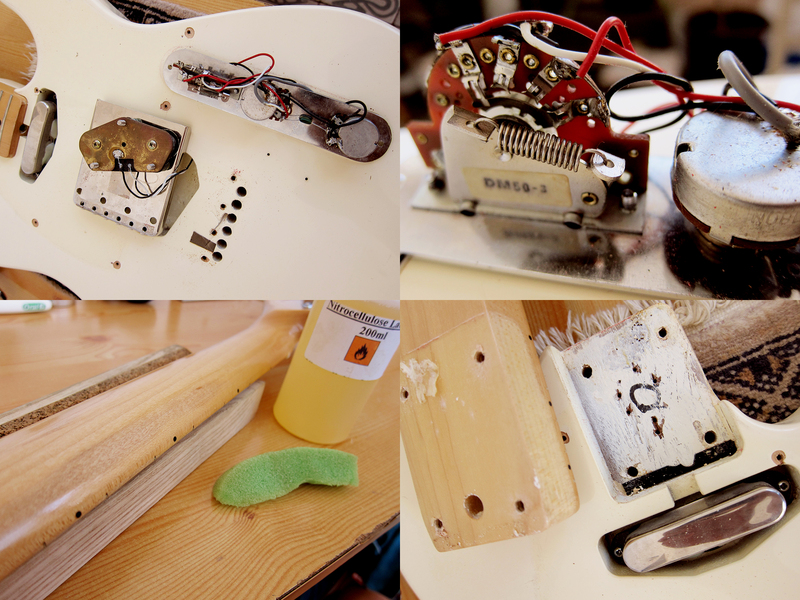 I took the guitar a part to look over the electronics and give it a good clean and set it up properly. The Switch is a bit worn so I will order a new one and replace that but the Japanese 500k pots are crackle free so I will keep the rest. This one is wired in an even weirder way than my Greco, with the ground from the bridge going to the first post on the treble pot. There were two big chunks on the back of the neck that was either worn or sanded down, which I didn’t like. I applied some Nitrocellulose lacquer with a sponge for not getting any sharp edges around, which worked pretty well, and then sanded it smooth with 2500 grit paper. Update: August 30, 2014 I got around to change the 3-way switch so now I finally got to hear the bridge pickup, not bad at all. I also bought 6 new screws that I cut since the original ones were really annoyingly long. When I got this guitar the action was too low for me and when I raised the saddles the screws that are holding them in place almost touched the strings so I decided to replace them with something shorter. I really starting to like this Telecaster now, it has a great twang and feel to it. My beat up old Hohner Stratocaster, bought cheap in London back in 2009. Notice that the logo is different on these two.